This afternoon, Diva Dan and I hosted the 1st Annual Optimistic View – Live event in our home town of Walkerton, Ontario Canada. It was a defining moment for us here in our town. I’ll level with you, as much as people classify me as a celebrity, we are just regular people within our home town. Reality is, people have no idea who we are as we keep a low profile within our town. We tend to keep our heads down and socialize very little. We do this intentionally as we are in fear of offending people for being gay. Though Canada generally are easy going with homosexuality, you get the few outspoken individuals that make sure you that you are put into your place and reminding you that you are a second class citizen. For those who go through this, you will understand what I am saying here. It’s not a fun feeling of feeling a vibe or sensing an uncomfortable undertone. Due to our success with The Crochet Crowd, we were asked 6 months ago to host the Optimistic View – Live Show here in our town. For two guys who have kept a low profile, the decision wasn’t easy and really we were more worried as ‘gay humour’ is natural for us. While on the internet, it’s easy to be ourselves as we find the population that accepts us and lets us be who we are. Bringing us out from under the stones in our home town is a completely different story. These are the people who will see us everyday as we go to the coffee shop, grocery shop and etc. The decision was tough but we were convinced to put down our guards to host the 1st Annual Show. You see, the development of The Crochet Crowd was a way for me to create my own community with a topic that I care strongly about. I can talk about crochet for hours as I love it and it’s my passion. I would rather surround myself, even through cyber means, with people who are enthusiastic… allowing crochet to be our connection to each other. Today, we let the real Mikey and Diva Dan out of the closet, sort of speak, within our town. After going through rehearsal, we were prepared and ready to present. Our mission was to raise money for families dealing with cancer in our region. Within a couple minutes, I honestly accidentally let a gay undertone happen and the audience blew up in laughter… I realized in that moment… I’m at home… and I am still okay and the audience is okay too. It’s possible that my fear may be unfounded and it is me giving off a standoffish vibe when it might not even be necessary. What is interesting about me… I have two personalities… I have my shy, introverted and hide in the corner personality… and then I have “Mikey – The Crochet Crowd Guy”. It’s like there are two personalities living within me. When Mikey – The Crochet Crowd Guy is invited out from behind the wall… it’s unbelievable what I am capable of and the power of the messages that can come from my mouth. In reviewing recordings of me after interviews and live shows and etc… I am like “Where did I think of that?” … “How did I manage some great timing for an undertone joke to slip?” It’s fascinating… and yet I am the person living within my soul. After I realized the audience was cool today… the rest of show just went on and we just let ourselves out to be who we are without question. Several defining moments of laughter in between such a tough topic. The first half goes by and we have intermission… So many people coming up to us congratulating us on a first half. Members of the Optimist Club all smiles and really supportive with the energy that we have brought to the stage. Second half of the show goes by… the laughter, emotions and much more happen. Even minor little slip ups were over trumped by humour to get us through which was a great way to hide a moment that could potentially stop the show. Everyone worked as a team and it was harmony. Audience members gave generously and had a great time at the same time. At the end… many community members excited and enthusiastic to talk to us. I will say… most of seen us at some point but because we keep our head down… mostly everyone is a stranger to us. In a community where I have kept a low profile, this was an awakening moment for me on a personal level. Daniel and I arrived at the local restaurant where 35 members were sitting waiting for us. We arrived in the restaurant and a bunch of ladies gave us a standing ovation… I had no idea who they are… but they were blown away by show. One was trying to recruit me to be a local actor for the stage productions. I declined as my schedule is really tough already with a lot of responsibilities. We then arrived at our group and again another large eruption of applause for the successful show. It was a complete surprise. Merely 4 weeks ago, this committee were strangers to us… though I don’t know most of their names without others have to point me in the right direction. We were amongst new found friendly faces being appreciated for our effort… an effort that allowed us to be who we are without changing our personalities to fit in. It was a surreal moment. I have always said that I have always felt like an outsider within my town… When you keep your head down like I do… it’s no wonder I am an outsider as I make little effort to get to know my neighbours or find out what is happening in town. So really, the fault is my own. Though I feel more at home in my home town this evening… it doesn’t mean I will start a gay pride parade or anything along that nature. It just means I can hold my head high in the grocery store or continue to devalue who I am. It’s a changing moment for me. This entry was posted in General Life With Mikey & Diva Dan and tagged crochet crowd, general, Life, Mikey. Bookmark the permalink. There is so much more to you two guys then the issue of your being gay. Don’t let anyone make you feel like you are unworthy because of that. You are both a great inspiration to so many people and I personally have enjoyed crocheting along with you and trying some of your patterns and have learned a lot through your videos and tutorials. I always wanted to learn to crochet and taught myself from a book with countless hours spent trying to get my tensions and stitches just right and can now crochet to my hearts content. There are still a lot of things I need to learn and I’m doing that through you. with new stitched and techniques. You don’t have to feel ashamed at who you guys are or for being gay. I’ve met a lot of gay men and they are usually more friendly and feeling towards others then the straight guys. I love you guys because you are warm and generous people when it comes to treatment of others and I say thank you for all the lessons and I hope you keep it up. I love your sense of humor Mikey and you always make me laugh. I love to hear Dan play his violin, such talent. God Bless you both and Keep on Hooking. Hold your heads up and walk proudly into the sunset. It is very obvious that you are very loved and thought very highly of by all of us at the Crochet Crowd! Now, translate that into how YOU think of yourselves! There will always be someone who will criticize, downgrade or demean…..but that is their problem. You have done so much for so many, you have brought joy, purpose and creativity into our lives….I appreciate what you do and who you are…Thank you!! This is such an inspiring life experience and I personally feel honoured that you were able to share it. I have gay people in my family as well as several homosexual friends and I am aware of the difficulties and single mindedness of society. Good on you and Daniel for standing and up and for doing what you love. I love your posts. Thank you. Mikey, I am so pleased and happy for you and Diva Dan. It takes guts to face people you think may judge you harshly, but ultimately we can only be ourselves. There will probably always be a few troglodytes, but most people are open and accepting. Although I only know you through the internet, you seem very friendly, open, caring, and fun to be around. You and Dan should always hold your heads up and be proud of who you are. I hope the two of you continue to associate with your community and thoroughly enjoy the many friends you will make. Hugs to you both. So very proud and pleased for you!! Sometimes small towns are a hard sell…but you …and they are blessed!!! What an awesome gift you have given to each other. I so enjoy your friendly, fun way on the videos! Keep on keeping on cause your and Dan are a gift to all who know you!! Dear Mikey, my heart breaks when I think of the way you have felt for far too long. Although most of us on the crowd may not be gay, I’m sure that a lot of us have other circumstances for which “normal” people would judge us very critically. I understand the walking with your head down feeling, I have done it in the past when I was so afraid of what I would see in people’s eyes. Then one day I decided that I would go on the “offensive” – if you will – I started looking directly at them smiling, and said “Hello!” It tends to put people off of their predetermined mind set just long enough that they don’t think to say something hateful, or judgemental. By the time they think of it, I have walked on by knowing that I may never see that person again, and they can think whatever they want about me, because the people that love me know me for who I am. Well, Mikey, we know you and love you for who you are. I am actually a little jealous of all those people in your town, they have the blessed opportunity to live right there close to you. I would LOVE to have you and Dan as neighbors! You seem like such a sweet, open, wonderful people, so full of life. I would be blessed to know you. I know that I probably will never get to meet you in person, but gosh if I did, I think I would just have to hug you for all the joy you have given me on the Crowd. Thank you for just being you! Thanks for sharing your feeling, enjoyed reading your blog. I have quite a few guy friends. Went to school with a few of them too. Many came out later, but all of them are wonderful people. Sometimes its just our own insecurities, when you put out love, much love comes back to you. Karma !! I use to watch your you tube video’s, for a while now and only recently joined your group. Thanks for all the good work you do. Love seeing all the cool ideas on a daily basis. I am planning to enter the Mad hatter contest and will be mailing out my hat tomorrow, if all goes well. What a lovely post. Mikey, you have such a splendid personality that your town missed out on a lot when you were in your head-down days. Now its people can benefit from having you and DD actively involved in the community. I hope you are welcomed everywhere. As an aside, I’m straight and have several gay friends; when I meet a new person who is gay but “head-down” I always feel like saying to them, “It’s ok, you can be yourself around me; you don’t have to use euphemisms or avoid certain topics” but I don’t want to intrude on their privacy. Maybe there are many like me in your town who are just fine with you and DD, but have respected what they thought was your desire to blend in. I think many straight folks are afraid of accidentally “outing” someone who isn’t ready for it, and so step carefully. That’s great for you two! Enjoy! Mikey, this world is a’changing and some of those changes are good! As the mother of a gay young man who felt the same way, I know that finding friends who accept you as you are in your community can make a world of difference in the quality and happiness of your life. Embrace this new-found freedom and hold your head up and let your smile shine for everyone to see. I agree with what Andrea had to say. We need more positve gay role models for our young people and even for our more “mature” people to see that you can live kind, constructive, happy lives and be a blessing to all who are willing to give you a chance. We love you both! And we’re so happy for you! appreciate you and Diva Dan and your personalities,,,You are both so fun and funny, also you are so organized and sharing and loving people. Thank you and I am so proud that you felt at ease among your New Friends. Angel hugs and happy hooking!!! That was really powerful and moving. Thanks so much for sharing this, Mikey. And thanks for sharing your love of crochet! You guys are gay??? Who knew!! Just kidding. Good for you and Dan and good for your town! What a wonderful experience for you! While I am not gay I grew up with Leonard who was. He was the most charming, talented, loving and gentle person I have ever known. Although he is no longer with us, aids took him from us some years ago, not a day goes by that I don’t think of him and miss his smile. While he would recognize the continued struggle gay individuals face he would be pleased at how far things have progressed since he was young. Continue being the positive role models that you are, we need those! I am proud to say I know you, even if only in a cyber way. Lol. Have a blessed day and congratulations!! Wow! Thanks for sharing such a personal story and trusting all of us. I am so sad that the North American culture has been looked at as so mean and intolerant due to its Christian roots. I follow the teachings of Jesus and I just love everybody, and believe me, he loves everybody too. I know many, many fellow followers who feel exactly the same way, so keep up the good work. Be brave, I Love Crochet!! You love Crochet, God loves you and crochet! This may not get posted but I hope you read it! Thank you for sharing this with us! What a wonderful experience and I’m so glad you and Dan will be able to be yourselves in your own town. And thank you for all you do for us here in your cyber community! You are truly a wonderful person. It is not up to people to judge anyone, Mikey love your Tutorials and I have learned a lot. You are a good person and so is Daniel. Thank you for the Crochet Crowd. Mickey, I am so happy for you to have this moment at home, and never doubt for a moment how loved you are abroad. I am almost a little jealous that I have to share you with your town now, lol! Mikey, you touch so many lives with your witty humor, knowledge and genuine concern for others. So happy your shared yourself with your home town! I know they will benefit from it! Good for you! I am very happy that it all went so well for you. I only found you on You Tube a couple of weeks ago, but since then, I’ve made a few wire and beads crocheted jewellery and my friends and family are loving it and I have orders already. It is all thanks to you. I wish I had been on that show: I would have definitely applauded you. Mickey always remember to hold your head high and don’t let your fears or others define who you are. Be yourself and be proud of who you are. Mike, you’re amazing! I’m from México, and my english is not enough to understand everything, but the videos and tutorials are very easy to follow, and I have learn a lot from you and the crochet crow… Congratulations!!!!!! So glad things went well for you!! It saddens me that people can’t be who they are and that people judge so easily. Please be proud of who you are. And THANK YOU so much for everything you do. Good for you and Diva Dan! Of course you are delightful and I’m sure Diva Dan is, too. Hold your head up, and be proud of who you are. You have done amazing things, and you have a true gift that you share with thousands of us. You are kind, thoughtful and insightful. Never put your head down again!!!!! Let the love of crochet form a shield that will protect you from those who are too ignorant to appreciate you for who you are. I am sure many have been impressed by your humility and kindness over the years . Your personality shines through in your videos and blogs. We love your website! Keep up the great work! Thank you for just bring you and sharing yourself and your talent for teaching and passion for your art with us all. Sounds like you had a great day. What a wonderful revelation. It is amazing what can happen when you pick your head up! Great job! It’s hard to be yourself, no matter what. The fear of rejection haunts each and every one of us at some point. When we think ourselves slightly different – sexual preference, skin color, body shape, profession – we find ourselves ‘standing out’ in some crowds. Well I say, be proud to stand out! It’s hard to come to terms with who you really are and let others see that, but once you do you will both find strength in that. It will become armor against those who may reject you for your beliefs or lifestyle or whatever. Stand strong! Know that you are who you are for a reason, although you may not know why, it is for a reason! Congratulations on a successful event, and garner strength from the experience. Know that people love you for who you are, will always love you for who you are, no matter what. 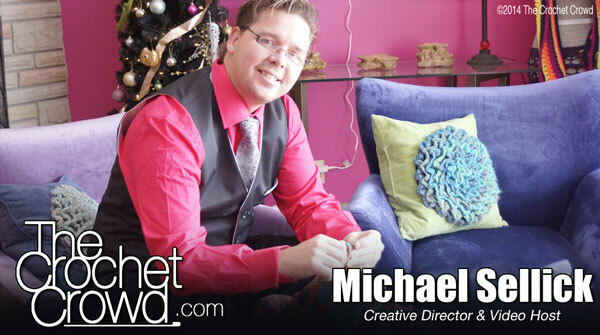 I have said this from the very first time I was on The Crochet Crowd web site… Mikey is the best. I have learned so much since I became a member of the Crochet Crowd and not all of it was about crocheting. You and Dan should always hold your heads up high… you are good, kind and compassionate people. Everyone involved with The Crochet Crowd team are awesome. Don’t change a thing. Keep the Faith! I am a straight woman who lived in the Middle East (very homophobic community) and have had gay bosses on a couple of jobs there. I can tell you, their sexuality never once influenced my opinion about them. I liked and respected them because they were very smart and honest men and treated me with kindest and respect. The Mikey and Dan that I met online are generous, kind and caring people – who give so much and ask for anything in return.. This is who you; this is how you come across; this is the way EVERYONE sees you. So how could anyone not like and respect you guys for who you are and what you do! Congratulations for both of you. You did something good for a lot of people, and I don’t mean only the gay ones! Very happy for both of you. Very glad your community is so inclusive. You have made so many people, including me, so passionate about something (in this case crocheting) and created such a lovely community online that it’s only right that your real, physical community is lovely too. Hi Mike. Your life style is between you and who you believe in as your higher power. I like to get to know people for themselves without attaching labels to them. You see, I have lived with labels most of my life and when I decided not to allow what others thought, life became like a breath of fresh air. Now, having said that, I love your crochet site and enjoy receiveing your emails with projects and know hows. Keep making those great things, as I know you will, and being just who YOU are, Mike! Congratulations to both of you on your evening of self discovery. I totally understand how you felt since I went through a similar one myself, 45 years ago. So glad things went well for you! You should never have to walk around your community with your head down for any reason! You are both great and have inspired me to get thru this terrible winter with your humor, challenges, and crochet advice. I look forward to meeting you on the cruise next year! Here’s to you and Dan. I am so glad you “came out” to your town and community. Whether it be now or much later, there will always be people that criticize you for being gay. That is certainly their prerogative. I hope you have found more accepting people in your community than critics. It is my hope, and I’m sure yours, that someday you won’t have to be afraid of people finding out that you are gay. I have many gay friends and outside of your gay community, you won’t find a stronger advocate. ALWAYS, hold your head up high. You have nothing to be ashamed of and so much to gain!!! You can’t be anyone but YOU! Anyone who rejects you for whatever reason; well, it’s their loss! We humans are such an interesting mix, aren’t we? Too bad so many of us still insist on defining other of us by such narrow parameters as sexual preference or skin color, or or, or…You get the idea.